What could be more fun than heading out into the garden or off to the playground on a brand spanking new balance bike or trike? 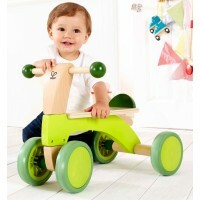 These magnificent wooden balance bikes and kids' trikes offer children the opportunity to take to two wheels in safety. They will help kids strengthen their growing muscles, improve their balance skills and learn to appreciate the joys of cycling! It will be hard to choose just one from our stunning selection of funky and cool bikes, but we're sure there's a balance bike here to suit your little angel!